Ellen Easton shares with us how to make these charming egg salad tea sandwiches. The colored egg white shavings add a delightful garnishment for these Spring themed tea sandwiches. Your guests will be enchanted with these bite-sized savories at your next afternoon tea. Serve these dainty tea sandwiches for an Easter or Spring themed afternoon tea. Also, enjoy Ellen’s Tea Infused Marbled Eggs, and Learn how to make Hand Decorated Easter Eggs. 2 options are provided on how to cook the eggs. Separate the egg whites from the egg yolks into separate bowls. Stir the contents of each bowl. Place the egg whites into an egg coddler (about 3 egg whites per coddler), and then place the egg yolks into a separate egg coddler (about 3 egg yolks per coddler). To the egg white coddlers only, add one drop at a time of food coloring until the desired color appears and stir to blend. Place the lids on the coddlers filled with egg whites and egg yolks then set the filled egg coddlers into a medium-sized saucepan. Cover with cold water. Set the saucepan over medium heat and bring the water to a boil. Once the water starts boiling, set the timer for 12 minutes to cook the eggs. When the time has completed, remove the saucepan from the heat and carefully remove the egg coddlers from the hot pan with silicone mitts. Place the egg coddlers into a second pan filled with cold water and allow the eggs to cool down. Once the eggs have cooled, use a flat edge knife to run the blade gently around the edges to remove the egg whites and yolks onto wax paper on a flat surface. Set aside the cooked egg yolks to use later. Use the larger holes of a hand-held grater to grate the colored egg whites. Set the grated egg whites separated by colors into individual bowls and set aside. Note: As another decorative option, hard-boiled egg whites can be cut into 1/2 inch slices. Then use cookie cutters to make shapes out of the egg whites. Directions for egg coloring solution: In a medium-sized saucepan over high heat, bring water to a boil and remove from heat. While the water is boiling, lay out some newspaper, paper towels, butcher paper or aluminum foil to protect the surface you will be working on to dye and decorate the eggs. Add 1/2 cup boiling water to each individual bowl. Then add 1 teaspoon vinegar per bowl and food coloring drops. Add one drop at a time of food coloring (10-20 drops) until the desired color level is achieved in each different bowl. After the egg yolks have been colored, remaining egg dye colors can be used to make hand-dyed and decorated Easter eggs or discarded. Peel the shells off the cooled hard boiled eggs. Slice the eggs in half then remove and reserve the egg yolks. Use the larger holes of a hand-held grater to grate the egg whites onto wax paper. Separate the grated egg whites into 2-3 small bowls. Add one tablespoon of selected egg coloring solution to each separate bowl. Gently toss the grated egg whites until the desired color is reached. Add more egg coloring if needed. Transfer each batch of colored egg whites into a small clean bowl that is lined with paper towels for draining off the excess color. Use a large circle shaped cookie cutter (or another shape of choice) to cut out a shape in a slice of bread. Spread a thin layer of mayonnaise on the shaped bread. Next top the slice of bread with the colored, grated egg whites of your choice. Place the cooked egg yolks in a medium-sized bowl and mash up with a fork. (As an alternative you can grate the cooked egg yolks into a bowl.) Select a small shaped cookie cutter and spoon a heaping teaspoon of egg yolk into the shape and press down. Layer the pressed egg yolk shape on top of the colored, grated egg whites. Note: You will have leftover egg yolks that can be discarded or mashed up with some mayonnaise and mustard for a snack to spread on crackers or celery. Sprinkle some salt and pepper on top of each sandwich. To serve, place open-faced tea sandwiches on a platter. For garnishment options watercress, arugula or cooked egg yolk crumbles can be placed around edges of platter. Optional garnishments to the egg salad may include: minced olives, fresh dill or caraway seeds sprinkled on top of the sandwiches. 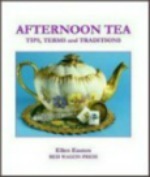 Ellen Easton, author of Afternoon Tea~Tips, Terms and Traditions (RED WAGON PRESS), a lifestyle and etiquette industry leader, keynote speaker and product spokesperson, is a hospitality, design, and retail consultant whose clients have included The Waldorf=Astoria, Plaza Hotels, and Bergdorf Goodman. Easton’s family traces their tea roots to the early 1800s, when ancestors first introduced tea plants from India and China to the Colony of Ceylon, thus building one of the largest and best-cultivated tea estates on the island.